Blimey, this live development stuff is really weird... it's like having a client that you never meet. Today was a good day, we made some real progress. 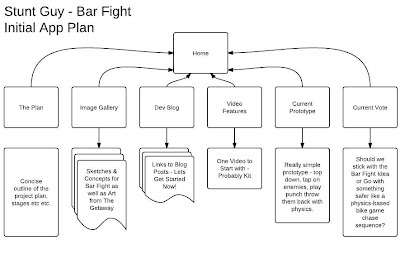 'The Getaway' is nearly finished and we've finally nailed-down what the initial release of 'Bar Fight' is going to look like. On the one hand it's going to be a bit of a pitch to you - our clients - the kind of thing we might submit as a first set of ideas for a project. 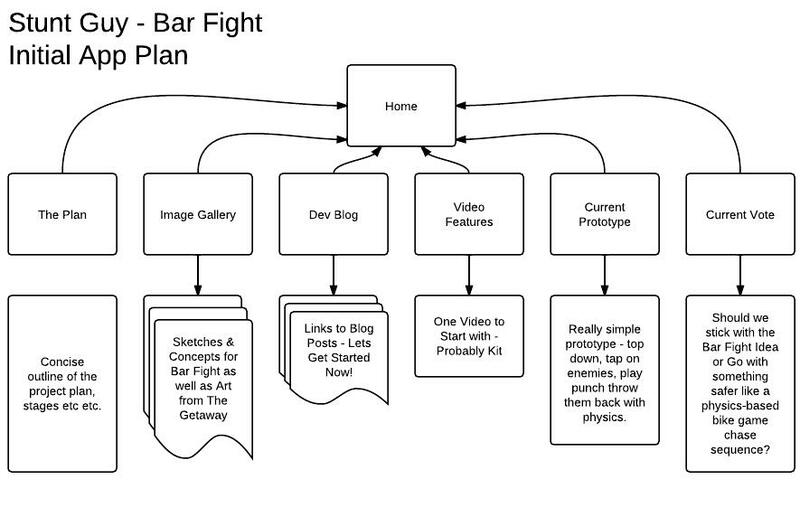 It'll therefore feature a simple prototype, initial concept art and an outline of the game/gameplay. However this isn't just about selling the game, it's also important to us that we use this as an opportunity to give you all a bit of insight into the development process. So we're planning to kick it off by including some really exclusive content - stuff we've never-ever shared before. There'll be raw art from 'The Getaway', storyboards, the development blog and a series of interviews with team members showing how they produce art, code and animations. There'll also be a series of public votes on the future of the project, we'll use this (as well as all the nice comments in the app-store) to shape the future of the game - you really will be as much part of the process as we will be. So, a good day, it's going to be really exciting, I do hope you'll join us for the ride!